Since I was young, my family would often have spreads on Saturday afternoons. They would consist of crusty French sticks, an assortment of cheeses, sliced Italian deli meats, olives, dips, and vegetables (our specialty is roasted red peppers). A few years ago I introduced my boyfriend to the concept of this impromptu meal – and he’s been hooked ever since. Although very simple, it’s been quite the occasion to go grocery shopping and pick up new foods and different wines to add to our meals (Case in point: Baba ganoush remained a mystery to me until a year ago, when we decided to try something different). This past weekend, I finally discovered the best way to eat brie (I’ve been living under a rock, apparently). Although we often pick up this creamy cheese – we’ve never tried baking it, until getting it as an appetizer last night. All the credit goes to my boyfriend, who always surprises me and tries different things (unless we go to Demetres or the Corner House). On the other hand, I typically stick with things that I know will be good (when it comes to appetizers – I’m more of a risk-taker when it comes to entrees). He saw the baked brie on the menu, when I couldn’t move my eyes past calamari fritti. What a fantastic decision – especially paired with berries! Today, I tried to create my own version of baked brie with berries. I baked my brie in my conventional oven for about 15 minutes at 300F. When it was ready, I drizzled some honey on top. 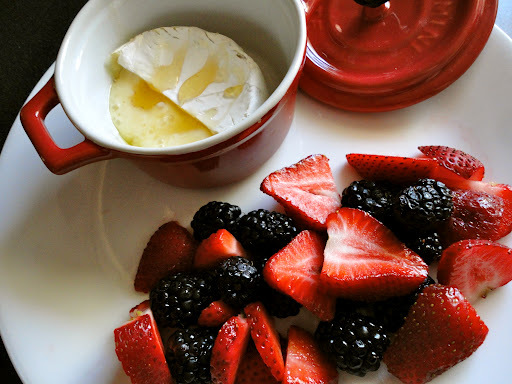 I paired the cheese with strawberries and blackberries (which I found to be too bitter). Needless to say, baked brie has landed itself a coveted position on our menu.